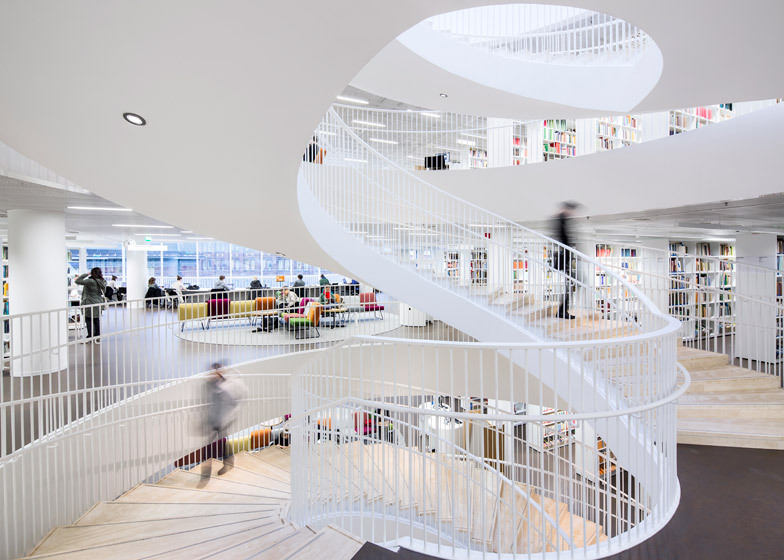 Elliptical openings create huge lightwells through the seven storeys of the Helsinki University Library by Anttinen Oiva Architects – another runner up from the first Finlandia Prize for Architecture (+ slideshow). 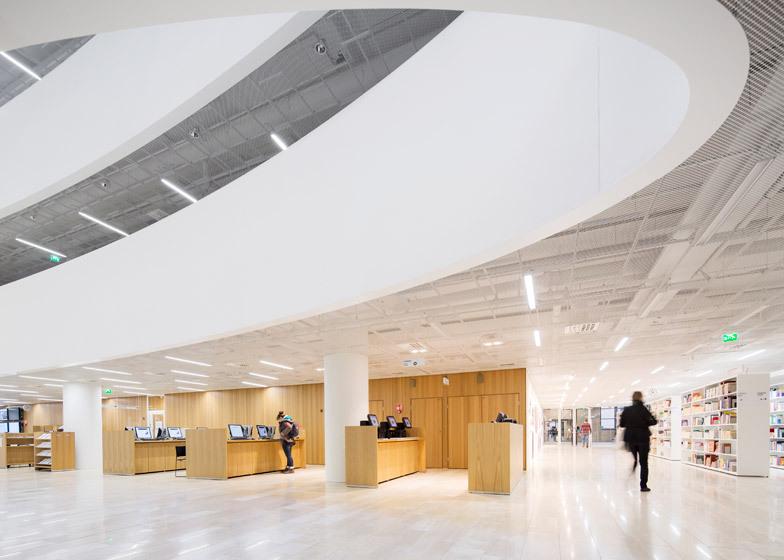 The Helsinki studio led by architects Selina Anttinen and Vesa Oiva won a competition to design the library, also known as Kaisa House, on the site of a former shopping centre within the city centre. The site is hemmed in by existing buildings but features two street-facing facades. 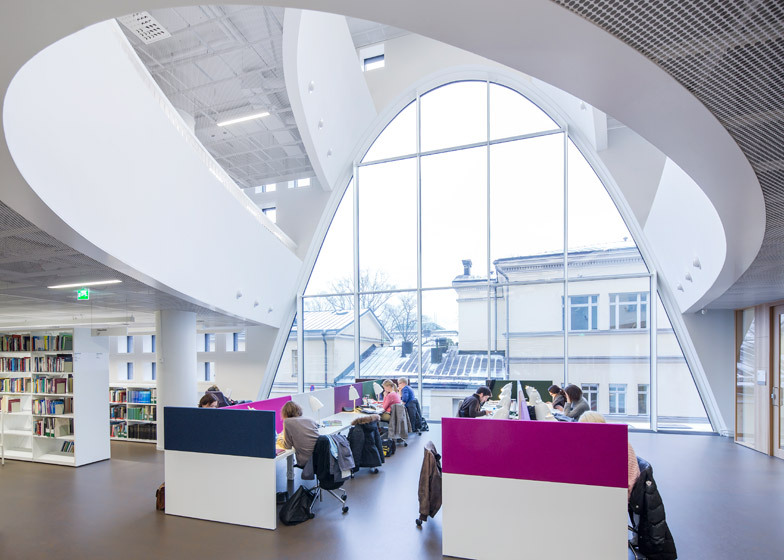 The challenge was to create a modern university facility that would fit in with this existing streetscape, but also with lighting conditions appropriate for a library. 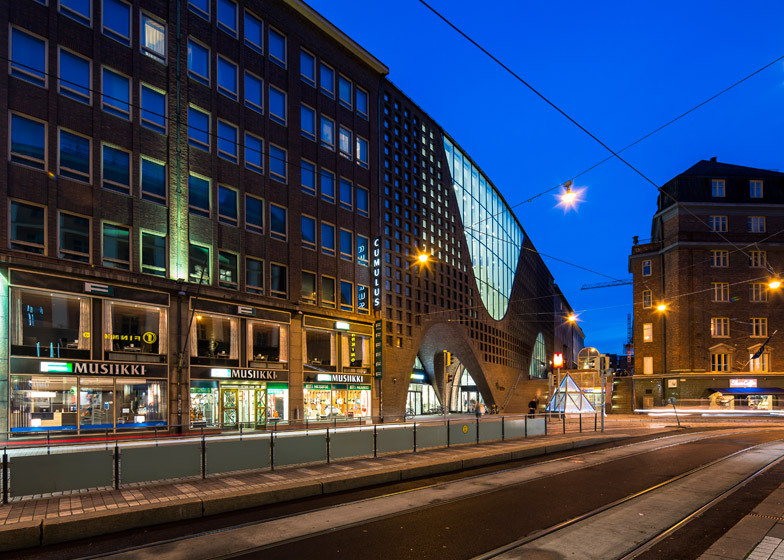 "The architectural starting point – the cityscape considered – was a vision of a unique public building that will suit its surroundings in terms of its materials, design and height," said the architects. 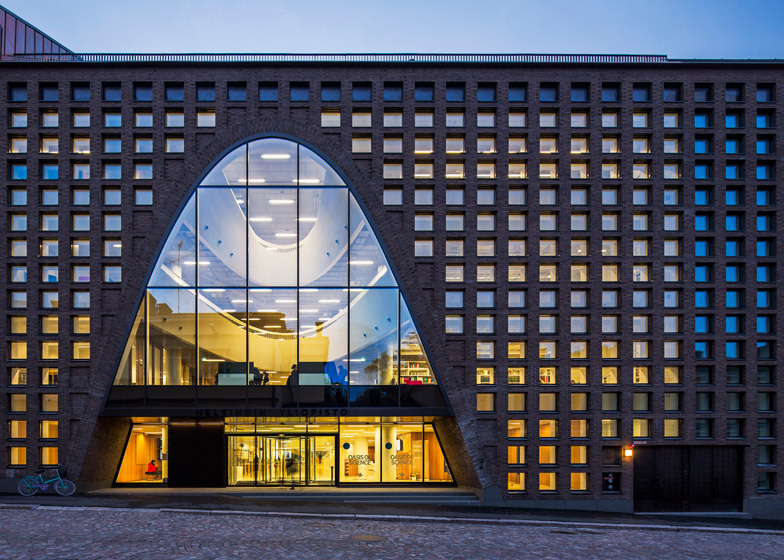 Anttinen Oiva Architects designed a seven-storey-high structure that lines up with the rooflines of its neighbours. 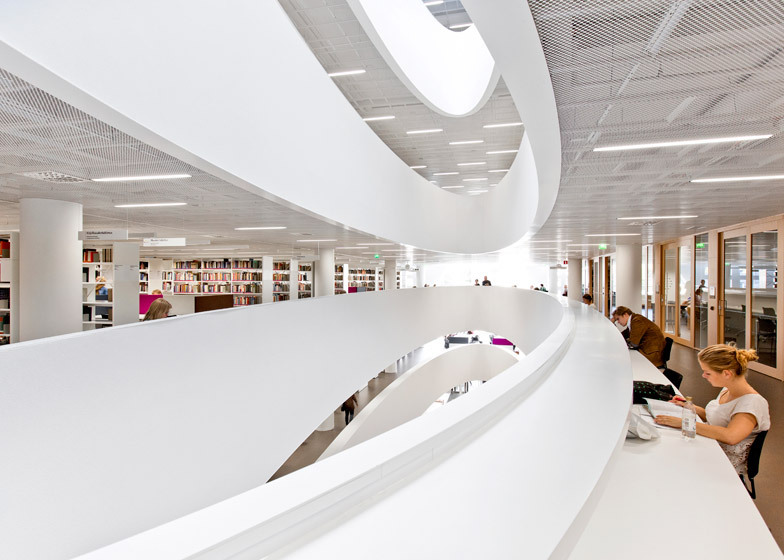 Within this, they traced the outlines of three large curving volumes, which became voids through walls, floors and ceilings. The first of the voids extends vertically through the heart of the building, creating a lightwell visible from every floor. The second and third voids can be found at the two ends of the building. 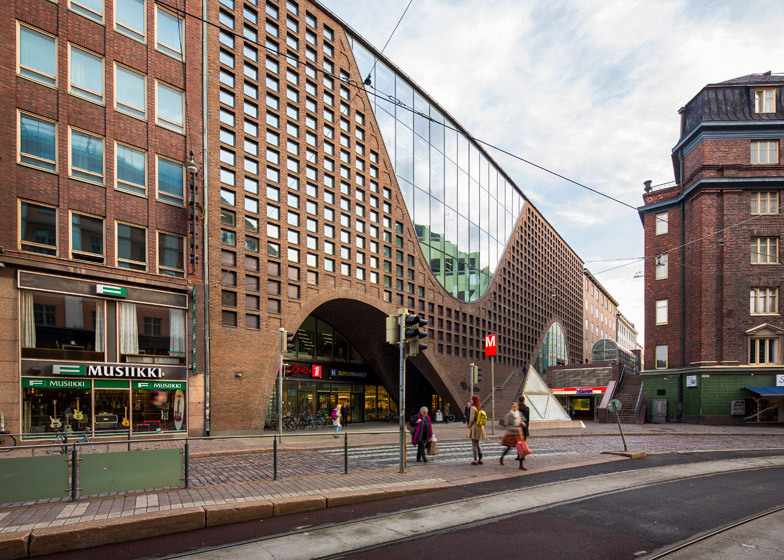 Here they puncture floors, but also create large curving windows to the street. 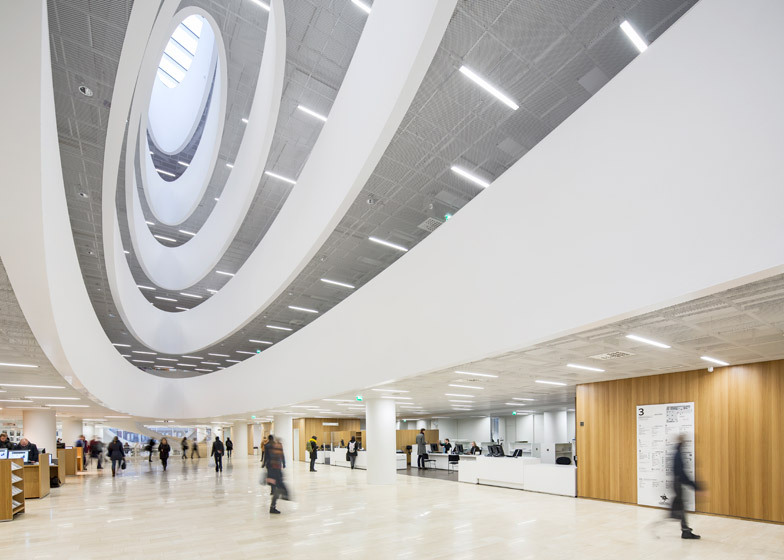 "Three distinct apertures and the main staircase form a series of spaces serving as a basis for the ambiance of the interior, the functional zones as well as the architecture of the facade," said Anttinen and Oiva. 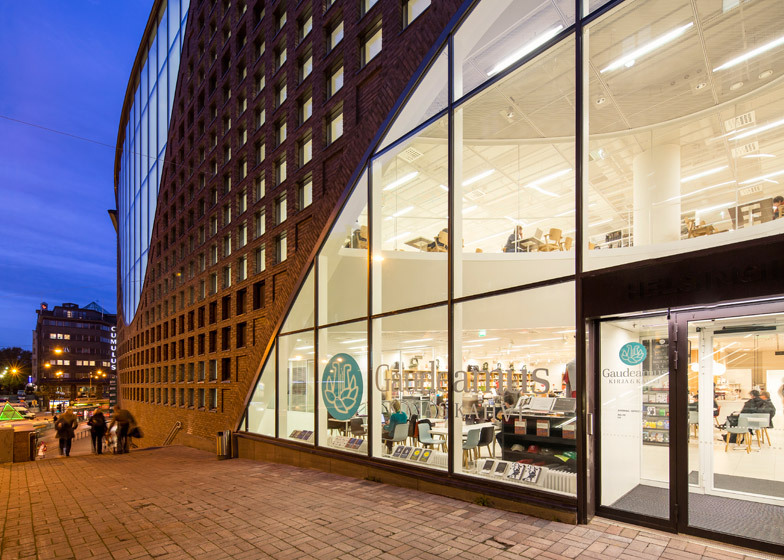 "The architectural concept of the facade directly reflects the functional solutions of the interior," they continued. "The apertures are encircled by walkways and the information zone, which is, in turn, surrounded by the collections zone." The library has two main entrances, although one is two storeys higher than the other. 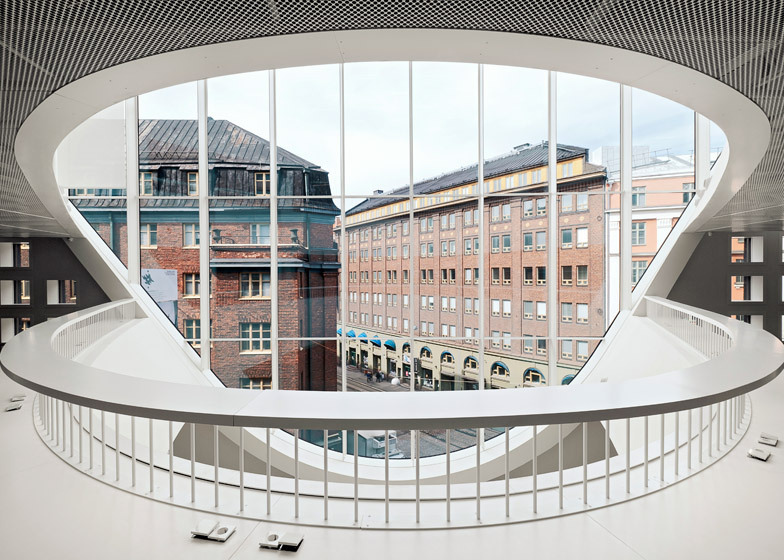 Both sit within the large curving windows, which are surrounded on all sides by a grid of smaller square openings, plus there's also a third entrance set a storey lower down. 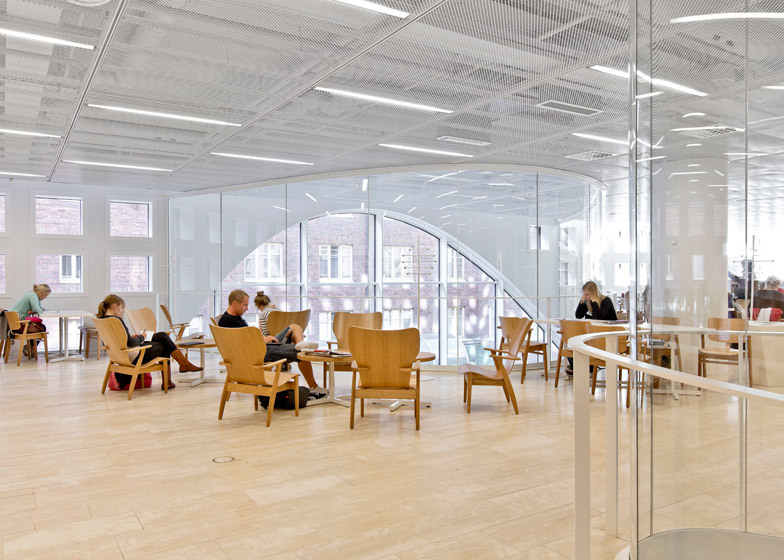 "The dense fenestration grid, which blurs the standard floor division, together with the large arched openings give the library a distinct external appearance," added the architects. 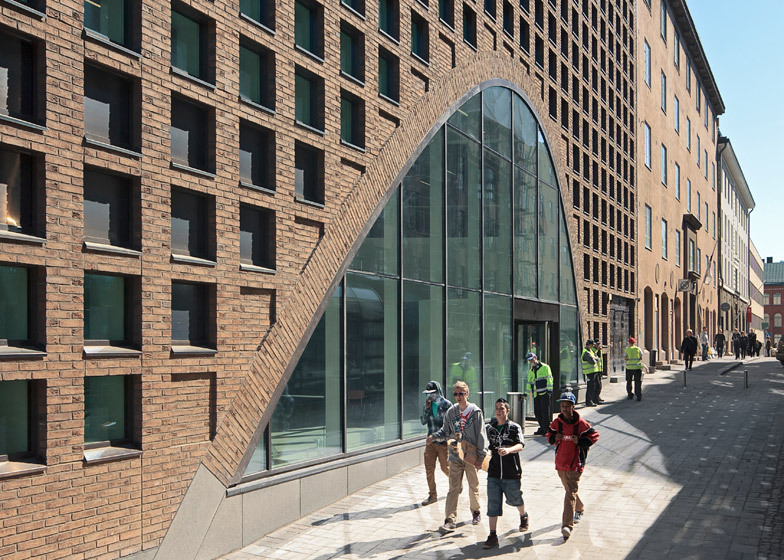 "By varying the size of the arched openings the building is fitted as an integrative solution within a situation of three different types of street space." The structure was built over the basement levels of the old shopping centre. Reinforced concrete give the building its primary framework, but suspended steel constructions allowed the addition of the ceiling voids. External walls are clad with red brick, while internal finishes include wooden flooring and suspended mesh ceilings that reveal the full height of each level. 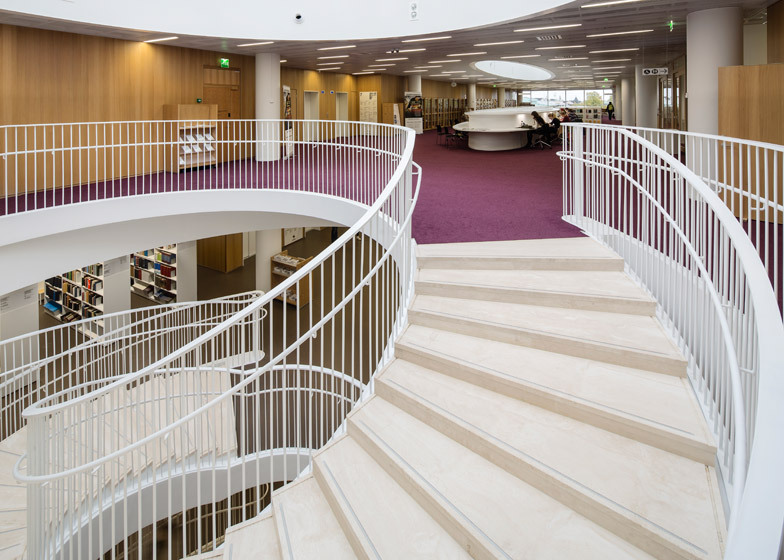 A large spiral staircase connects the main floors of the library, excluding the logistics centre and maintenance facilities below ground, which are mainly accessed by lift. A balcony on the uppermost level offers views across the city rooftops. 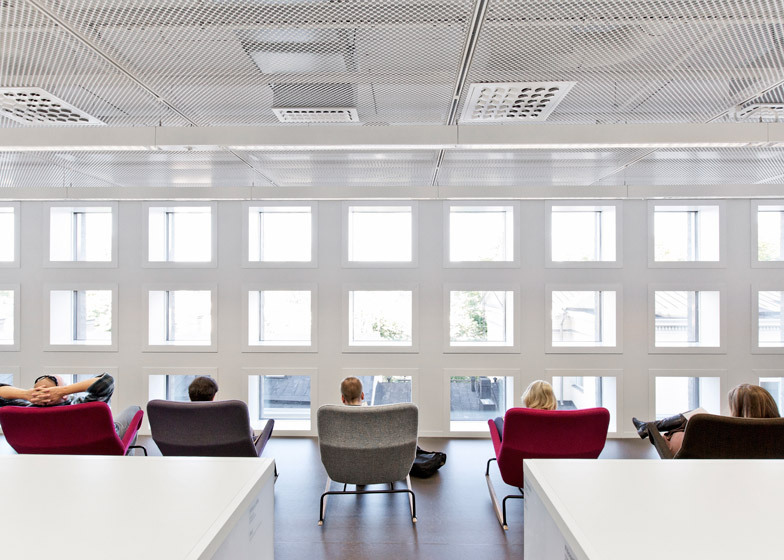 There are also sound-proofed rooms, used for both quiet reading and noisy group work, and a series of smaller reading rooms for private study. 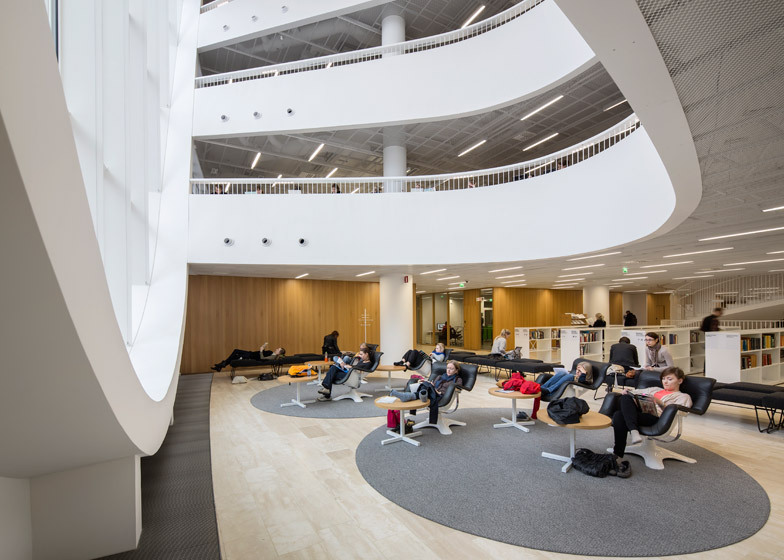 The Helsinki University Library was one of four projects shortlisted for the first Finlandia Prize, which is to be awarded every three years to a project either by a Finnish architect or built in Finland. 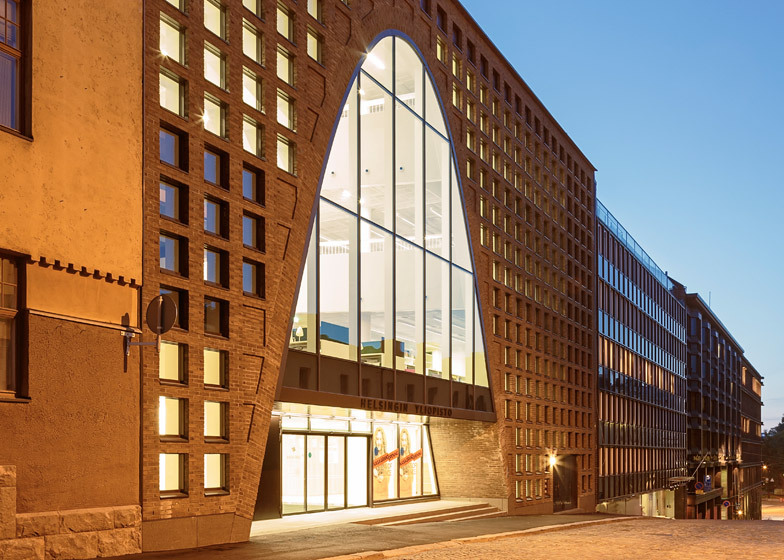 This year's winner was a museum in Warsaw dedicated to the history of Polish Jews.